PDA - What is it? The persistent ductus arteriosus botalli (PDA) is one of the three most common congenital heart diseases in dogs. The origin of this malformation comes from the prenatal circulatory status in the womb. As unborn animals don’t breath, the lungs don’t have to be supplied with blood. At this time the aorta and the pulmonary artery are connected via one vessel (ductus arteriosus botalli). To prevent an unnecessary blood flow to the lungs, there is a bypass between pulmonary artery and aorta, which leads the blood from the right heart chamber directly past the pulmonary circulation back to the body. For sound animals this bypass closes within 48 hours after birth. If this doesn’t happen, we talk about a persistent ductus arteriosus botalli. As before birth the pressure in the pulmonary circuit is higher than in the body circuit, the blood flows from the right side to the left. 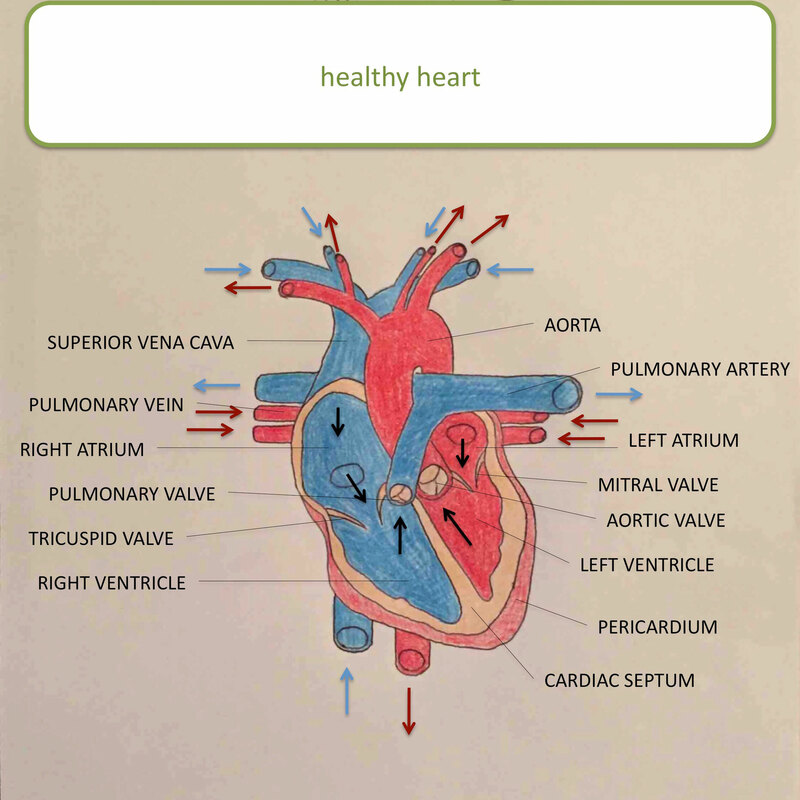 With the first breath of air after birth the lungs expand and the pressure drops, on which the direction of the blood circulation changes - the blood now flows until the closure of the ductus arteriosus botalli from the left side (body circuit) to the right side (pulmonary circuit). If the closure doesn’t happen and a PDA stays, there can be 2 different pathological blood circuits (shunt flow) formed with different diagnosis, symptoms and also different treatment. Which different types of PDA do exist? PDA can be classified in two different types due to the flow direction of the pathological blood flow. 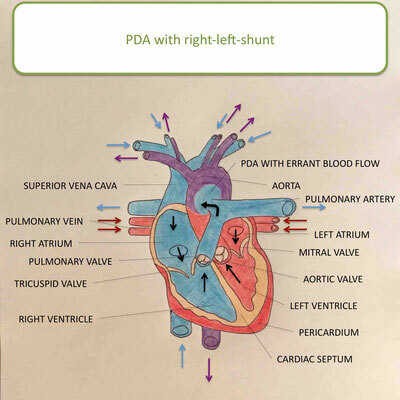 At the PDA with left-right shunt oxygen-rich blood flows from the lungs into the left half of the heart, into the aorta and back again over the PDA into the lung and left half of the heart. Depending of the size of the PDA and therefore overload of the left half of the heart, the result is a growing of the left heart side and backlog into the lungs, wherof in the worst case a pulmonary oedema results. Additionally the body will suffer an oxygen deficiency, as only a very small amount of the oxygen rich blood goes from the aorta into the body. 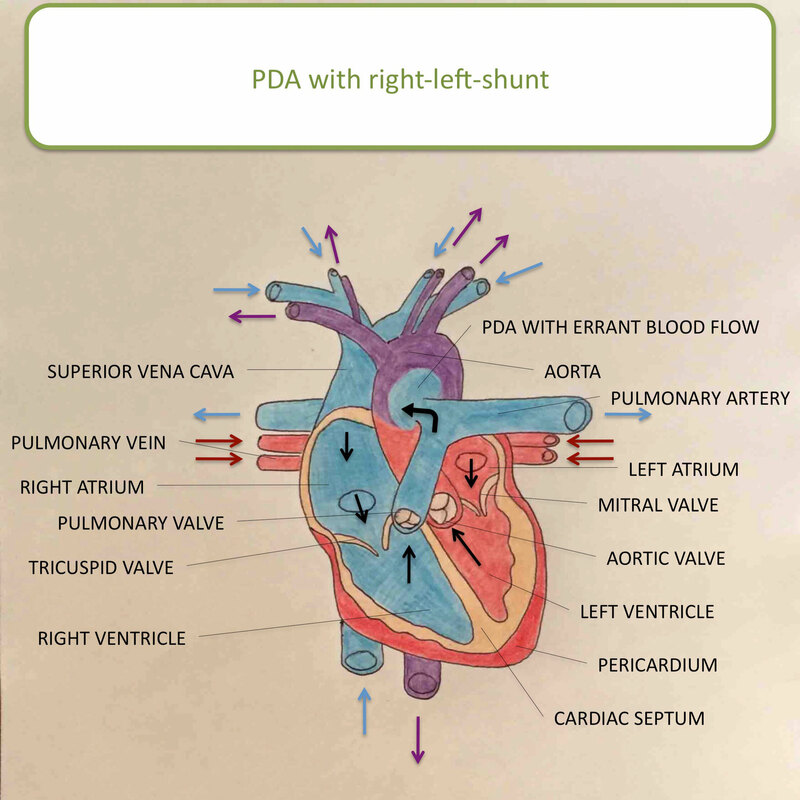 The PDA with right-left-shunt is much rarer than the left-right shunt. In few cases it happens that after birth the pressure drop doesn't occur and the change in flow direction doesn't happen. But even after the pressure drop it can happen in the course of the disease that the backlog into the lungs leads to higher pressure in the pulmonary curcuit. 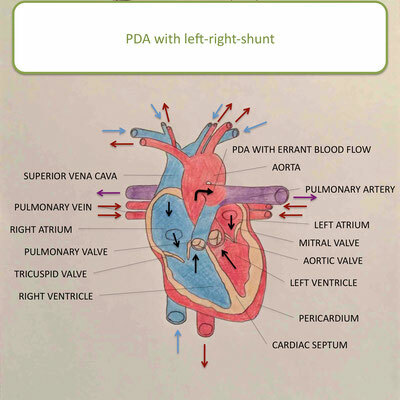 If a right-left shunt exists, the blood low in oxygen flows from the body into the right half of the heart, into the pulomnary artery and back through the PDA by a devious route into the aorta into the body curcuit. The misdirected blood cannot be enriched with oxygen in the lungs and this leads to a reduced oxygen supply in the back half of the body.